As seen on the big screen in the summer of 2016, The Suicide Squad is a loud, obnoxious, boisterous, and argumentative group of brightly colored costumed villains who are forced to work together in order to help mankind. Many who loved the film have no idea that, nearly 60 years ago, it wasn’t always so. Starting with their first appearance in 1959, Suicide Squad: The Silver Age Omnibus collects the team’s earliest adventures. Jam-packed with dinosaurs attacking planes, Pterodactyls carrying tanks, and the everpresent possibility of an atom bomb going off before someone can get a six-story robot under control, the collection is pure Cold War era monsters, mania, and mayhem. This book features more dinosaurs than almost any other comic book in history! In the original Suicide Squad, writer Robert Kanigher pulls inspiration from Jules Verne, Edgar Rice Burroughs, and films such as The Incredible Shrinking Man and The Beast from 20,000 Fathoms. Created during a time when America’s biggest enemy was Mother Russia and the concept of Communism, the original Suicide Squad completely ignores any specific connection to reality as gigantic monsters, robots, volcanos, tidal waves, and mutated, albino gorillas wreak havoc across the world’s landscape. The classic nature of these exploits came from the creative talents of DC editor/writer Robert Kanigher and artist Ross Andru on pencils with Mike Esposito on inks. By 1959 all three were veterans of the comic book industry with Kanigher’s own history reaching back almost 20 years. It is said that during this period he was writing an average of one comic book story a day. It is only natural for a writer under that kind of pressure to look to other sources such as the classics or film for inspiration. In 1946 Kanigher began a 22-year run for the company as writer and, later on, as editor of Wonder Woman. Andru and Esposito had started with DC in 1951 by drawing short war stories for Kanigher who was by then editing and writing many of the stories in DC War titles. In 1958 he hired the duo to become permanent artists on the Wonder Woman’s self-titled book. Over the next nine years the new team would reinvent Wonder Woman and add to her family and legend. Then Editor Kanigher was called on to create something brand new for DC’s newest try-out book, The Brave and the Bold that he turned to Andru and Esposito. The result, The Suicide Squad, is considerably closer to the Jack Kirby-created powerhouse The Challengers of the Unknown in feel than it is to the Justice League. Led by hard-scrambling pilot Rick Flag Jr., (the only character to carry on into the modern age), the team adheres to many of the stereotypes and tropes of the late fifties. Still, it does so with joy and an obvious love for comics. There is the unrequited and very chaste love of Flag’s blonde girlfriend, Karin Grace. She also happens to be a skilled nurse. Naturally Flag remains frustratingly oblivious to the depth of her feelings, seeing only her medical skills and dedication to the Suicide Squad. Rounding out the team are astronomer Dr. Hugh Evans and physicist Dr. Jess Bright. Both have worked on nuclear tests and are more than happy to leave their desks and televisor-analisor screens to join the other two in the field. There is a good deal of comic and art history connected to these stories. First is the presence of Kanigher as a writer. He was part of the team that created the Silver Age Flash in 1956 and, by 1959, had established himself as one of the best writers of war stories in the comic industry. Not only that, but Andru’s art work is so evocative of the comic book medium that he was one of the artists that Roy Lichtenstein chose to pull from while creating his series of pop-art painting in the sixties. Lastly, the late Darwyn Cooke, one of the greats of the modern era found inspiration in these and other war stories created by the Kanigher. Taking the premise behind the features such as Suicide Squad, Dinosaur Island, and The War That Time Forgot, Cooke brought them into the modern age by incorporating aspects of the original storylines into the book and eventually the animated film, New Frontier. One look at a page drawn by Andru and inked by Esposito can tell you why professionals such as Cooke and Lichtenstein came back to their work. Andru’s lines seldom contain an ounce of fat and when they do, Esposito knew his partner so well that he was able to cover anything up without a hitch. When they were teens the two would sit in the New York Museum of Natural History and draw the dinosaurs on display. 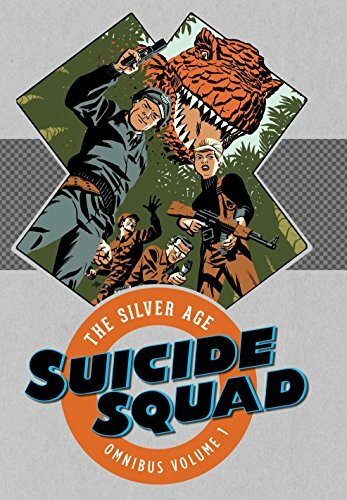 Their work paid off as Suicide Squad: The Silver Age Omnibus is filled with some of the most fun and adventurous dinosaur stories since Edgar Rice Burroughs began the Caspak trilogy. These are stories to be enjoyed by all ages for both their absurdity and beauty.